The games in the 4K resolution are not yet a reality for everyone, this is fact. Even so, the Linus Tech Tips channel team is already experimenting with 16K games. That’s right, a totally new resolution and far from what you see today. Despite some problems, everything worked as expected. In order to understand the range, 16K is equivalent to 64 times our Full HD 1080p standard. 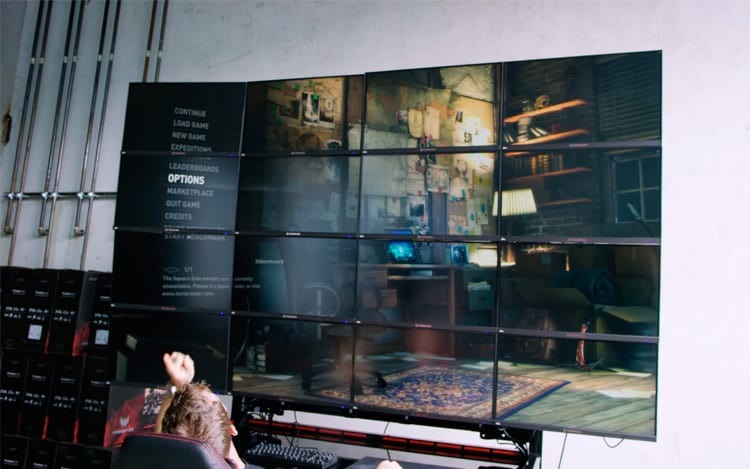 So, if you already have a 4K TV, the Linus setup has 16 times more pixel than your device. In order for the equipment to work as expected, channel personnel used four NVIDIA Quadro P5000 video cards, which are very powerful GPUs. To merge such boards, they needed a “Quadrosync”. Only these cards cost about the US $ 10,000, that is, more than R $ 30,000. To complete the feat, 16 4K IPS Acer Predator XB1 monitors were used to mount the image. Taking into account only the part of the displays, not counting the edges, the super screen measured 2.39 X 1.35 meters. The motherboard used was a Rampage V Edition 10 6900K from Asus and still 32GB of RAM from Corsair. Even with all that, some games did not run in 16K, like Rise of The Tomb Raider, which, with the staggering, ended up locking in the 3 or 2 frames per second. Simpler titles like Minecraft and Half-Life 2 managed to work without any problem, with an average of 40 fps.